Washington – Rep. Elizabeth Esty’s decision to not seek re-election has opened the door to the most competitive congressional race the state will see this year, a contest that also will play a part in the fierce battle over which party controls the U.S. House of Representatives. Publicity over the scandal that embroiled Esty and the rarity of an open seat in an especially hot midterm election will make the contest a nationally watched race. “It’s leaning Democratic, but I would put it in the competitive column,” said Gary Rose, head of the political science department at Sacred Heart University. The 41-town district in northwestern and central Connecticut has slightly more registered Democrats than Republicans and a big group, about 40 percent of the electorate, of unaligned voters. 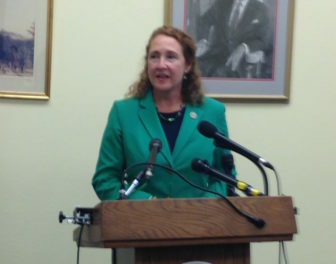 Esty won re-election to the seat by wide margins since her first bid to represent the 5th congressional district, a close contest in 2012 against Republican Andrew Roraback. Kyle Kondik, managing editor of Sabato’s Crystal Ball at the University of Virginia Center for Politics, downgraded the district from “solid” Democratic to “likely” Democratic after news broke last week about Esty’s failure to immediately fire or suspend a former chief of staff who was accused of abuse. Kondik said Esty’s decision to leave Congress after her term is up has increased Democratic chances of keeping the seat. “But we are also holding out the possibility that it could get more competitive than we have it rated now,” Kondik said. The good news for Democrats wanting to hold on to the seat is that the 2018 election is going to be tough for Republicans. The party made huge gains in the House in both the 2010 and 2014 midterm elections, pickups that gave them control of more seats than Republicans had held in decades. The GOP made those gains because a Democrat, Barack Obama, was in the White House, and the party in power in the White House usually loses seats in a midterm. But now Donald Trump, a Republican, is in the White House. There is also a strong anti-Trump movement and energy within the Democratic base. From Virginia’s 2017 elections to the special election victories of Sen. Doug Jones in Alabama and Connor Lamb in a special election for a House seat from Pennsylvania, the Democratic base has been hugely activated while Republicans have struggled to match that momentum. “You can expect Democratic turnout to be better than it was in 2012 or 2014,” Kondik predicted. Nationally, Democrats need to flip at least 24 seats in the midterm election – and keep control of all the ones they have now, including Esty’s – to gain control of the U.S. House. The good news for Republicans hoping to seize the 5th District seat is that GOP gubernatorial candidate Tom Foley carried the district in 2014 by about 7.5 percentage points, even though he lost the statewide vote to Gov. Dannel P. Malloy. A strong Republican candidate for governor could energize GOP voters in the district again, helping the party’s congressional candidate. And, with Malloy’s low approval ratings and criticisms of how general assembly Democrats handled the state budget, “the Democratic brand in Connecticut is not great right now,” said Kondik. The 5th District has been represented by Republicans before, but not since former GOP moderate Nancy Johnson lost it in 2006 to Democrat Chris Murphy, who now represents Connecticut in the Senate. Esty’s seat was already on the Democratic Congressional Campaign Committee’s list of vulnerable incumbents because Hillary Clinton carried the district narrowly, 50 percent to 46 percent for Trump. But Esty won re-election by 16 points. “But it’s not an easy district for them,” he added. Both the DCCC and the National Republican Congressional Committee say they will be involved in the race. The question is: How much money and help will they give their candidate in the 5th District. The DCCC has outraised its GOP counterpart in this campaign cycle. According to the Center for Responsive Politics, the DCCC has raised a little more than $125 million and the NRCC has raised nearly $106 million. Of course, a key factor is the quality of the candidate and his or her campaign. “This is a prime opportunity for Republicans to reclaim that seat, but they have to be careful who they nominate,” said Rose. Former Meriden Mayor Manny Santos filed as a GOP candidate weeks ago. Former state Rep. Dan Carter, who unsuccessfully challenged Sen. Richard Blumenthal in 2016, is another Republican considering entering the race. Romano said state Sen. Eric Berthel, R-Watertown, and state Sen. Kevin Witkos, R-Canton, are also eying a run. On the Democratic side, Mary Glassman, the former first selectman of Simsbury, has jumped into the race. State Rep. Michelle Cook, D-Torrington, is considering it. State Rep. Liz Linehan, D-Cheshire, said she isn’t interested, though some state Democrats are urging her to run. Candidates for the 5th District race have a June 8 filing deadline.